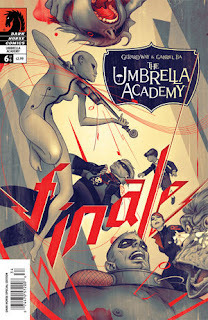 #1 UMBRELLA ACADEMY APOCALYPSE SUITE #6(OF 6) - Like my last post saids this is the most creative book I've ever read. I'm probably going to end up reading this in the parking lot of my comic shop. #2 JUSTICE LEAGUE OF AMERICA #18 - Didn't like the last issue and this is continuing that storyline. I like Burnett writing the stories in theory, cause he did such good work on the JLU cartoon, but issue 17 didn't click with me. Hopefully this issue will turn around and prove me wrong. #3 COUNTDOWN TO FINAL CRISIS 10 - Yay! We're all on apokolips and brother eye is doing things I don't understand. 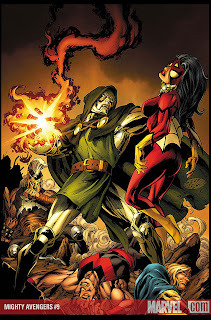 #4 MIGHTY AVENGERS #9 - Two Words: Doctor Doom! 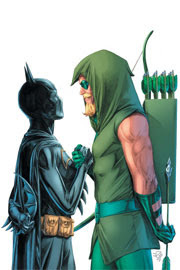 #5 BRAVE AND THE BOLD #10 - What a great book we get to see character's rarely used. Teaming up with the best of the best and their is absolutley no limits as to when and where a story can take place. I hope this book is around for a long time and George Perez is on it forever. #6 SHADOWPACT #22 - I used to love this book. It has steadily declined in quality. I just want the team to get back together and fight as a unit. #7 IMMORTAL IRON FIST: ORSON RANDALL AND THE GREEN MIST OF DEATH - Iron Fist is having a renaisance that's for sure. #8 ZORRO #1 - I'm a huge fan of Dynamite's Lone Ranger comics, hopefully this will be equally as good and provide a new interpretation on the classic western character. #9 DEATH OF THE NEW GODS #6 (OF 8) - I don't know all that much about the new gods. I enjoyed the countdown special. I am quietly perplexed and intrigued by this book since the reveal of the source as a sentient entity. #10 BATMAN AND THE OUTSIDERS #4 - I didn't pick up the first three issues some how this book slipped under my radar. I am picking this one up beacuse of Ollie's induction to the team. From far away I am not a fan of the line up, but if this issue sizzles. I'll probably jump aboard and pick up the first three issues.